This amazing flavour combination of smoked haddock with cheese is one of James' favourites! It's so easy to make too! Set the grill to a high heat. Place the milk and bay leaves in a deep fry pan and place over a medium heat. As the milk begins simmering add the haddock and poach for 2 to 3 minutes. In a second pan melt half the butter over a medium heat and add the leeks. Cook the leeks for 2 minutes until just softened. Season then spoon into individual casserole pans. 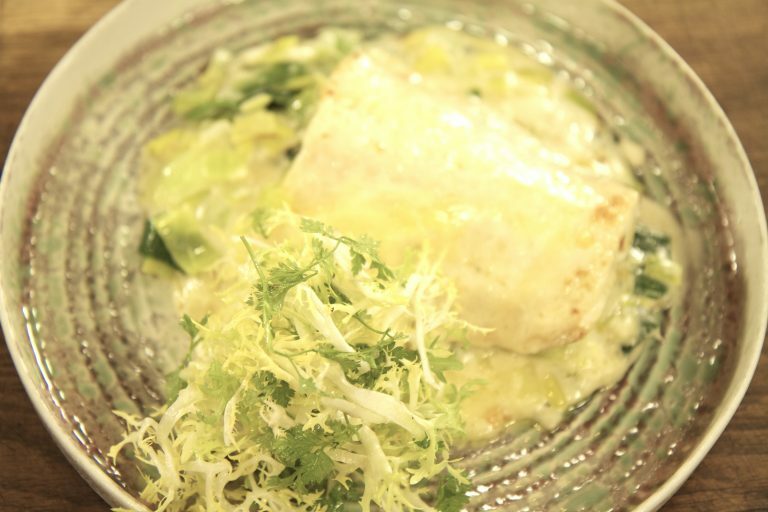 Place the poached haddock on top of the leeks, reserving the poaching milk and discarding the bay leaf. Melt the remaining butter in a pan over a medium heat and whisk in the flour. Cook gently for 1 minute, stirring continuously, then gradually whisk in the poaching milk. Bring to the boil, remove from the heat and whisk in two thirds of the cheese, then add seasoning. Pour the sauce over the haddock then sprinkle over the remaining cheese. Pop under the grill for 2 minutes until golden and bubbling. Meanwhile mix make the salad dressing by mixing the olive oil, Dijon mustard, white wine vinegar and water. Use about 1 tablespoon of the dressing to coat the frisee lettuce. Spoon the fish and leeks onto a plate and serve with the salad.